Plan: Rectangular With one story wing on east elevation. Significance: Identified as architecturally significant in the 1972 Illinois Historic Structures Survey and was subject to an intensive level survey in 1976. Historic Features: Dominant gable offset from entrance, gables roof line dormers; bay window with copper roof on south elevation; attached garage. Alterations: Windows replaced on south elevation. Building Permit Description: 2-sty brick family dwelling with attached gar, Plat of Survey (1929.25.03) in file at EHC. Exterior Alteration Permits: 05FRA0000000116: Fence. Other Permit Information: 1935.10.06, BP #21138 for 2-sty brick house improvement and add to rear of bldg. "Cancelled, no work" written on BP#21138 (microfiche). OWN Freeman Day, ARCH Mayo & Mayo, BLDER George Bennett. 1974.01.07, BP # 41259 to remodel kitchen ($2,000). Owner Robert Oakes. 1988-Aug-18, BP#88-17143 construction of wood deck (472 sq.ft. approx). OWN Ira Gould. 2000-April-18, BP#00-51498 to re-roof. OWN: Danielle Gould. 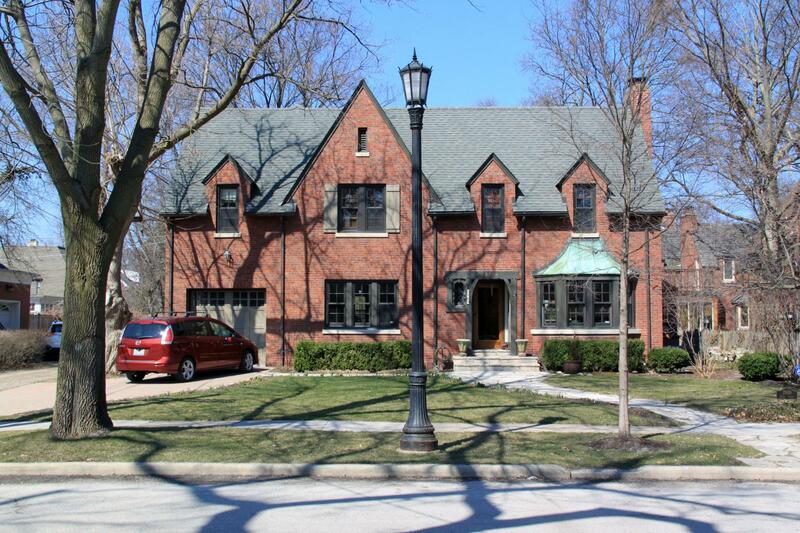 Historic Info: Source: Evanston History Center Archives (3-ring binder) STATEMENT OF SIGNIFICANCE: A9 Your house has been designated an Evanston Landmark because it was identified as architecturally significant in the 1972 Illinois Historic Structures Survey. The Evanston Preservation Commission began its own intensive survey in 1976. Because a thorough and accurate evaluation is a lengthy process, the Commission has completed study in six of the ten designated areas. Your house is located in one of the four unsurveyed Intensive Study Areas. When the Commission completes its evaluation of these areas, additional information on your house will be sent to you.